This story really begins this past Good Friday. I had plans to attend Palmyra Sportsmen’s Club annual Good Friday Bunny Shoot, and I wanted my son and daughter to attend with me. Like many 15 year-old girls, my daughter’s plans can change on a whim, so I decided not to bug her about going with me but instead to “anchor” her by invited her boyfriend Zack. He accepted the invitation without hesitation. Now there was no way Maddie was going to allow me to take Zack to an event without being part of it. The same tactic worked with my son Ben. Initially, he wasn’t really that interested in attending, but he had a friend who wanted to try it and, after making a few phone calls to his parents, I was suddenly going to the Palmyra event with four very green shooters. To make a long story short, they all had blast trying to hit those little clay bunnies, and right after that, both of my kids expressed an interest in shooting clays at my club. 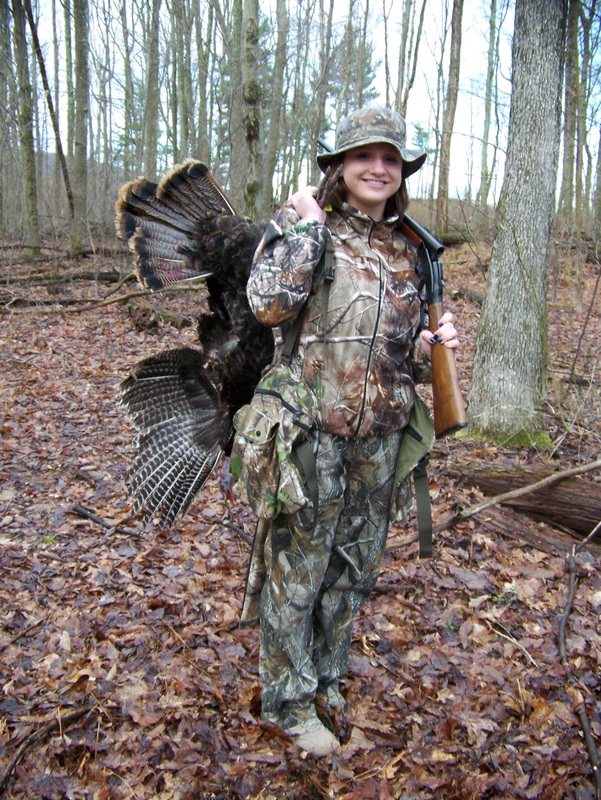 Maddie also confirmed that she wanted to try turkey hunting. At this point I called Neal Goodman, legendary turkey whisperer from Schuylkill county, and reminded him that we could take Maddie during the special youth season, a week before the spring opener. With his son now outside the age range for youth participation, Neal gladly opened his home to Maddie and I and we made the journey to Mahanoy City, PA.
Maddie Miller with her 2013 Schuylkill Co. Spring Gobbler. The following morning was “textbook.” Neal had done his homework and knew where some turkeys might be roosted. While we were a little later than we would have preferred, we were in the woods listening at first light. A short walk and about ten minutes later, we heard a bird answer Neal’s lonesome call. We had Maddie get as comfortable as possible with her back against a big tree, and Neal and I posted about twenty yards behind her. Then Neal began working his magic, call conservatively but with enough passion to bring the bird in from about 100 yards or so. With Neal using three different calls, and me pretending to be the fourth hen, we brought the bird within sight in about 25 minutes. So I want to once again thank Neal Goodman for helping me plant the seed of hunting. I’ve got my work cut out for me now, but I’ve been waiting for this day for a long time and am overjoyed that it finally arrived. To the other dads out there trying to engage their kids in hunting … don’t stop trying and don’t be afraid to invite friends on your outings … it makes it more enjoyable for kids if they have a friend to share the experience with. ← Sara’s Kitchen: Trout Cook-off! Nice shooting, Maddie 🙂 And great job, Dad, for getting her into it. awesome! Congrats on your first spring gobbler.